Bands and fans win! Participating musicians will be eligible for a chance to perform at the World’s Largest Music Festival, Summerfest 2012 and win a share of $45,000 in cash and prizes. Fans who vote online can win a new car and trip to the Big Gig. Aspiring musicians are challenged to enter the “Land the Big Gig” music talent search now through Sunday, April 22 by submitting an original performance video online at www.LandTheBigGig.com. Land the Big Gig is a great way for talented musicians from around the country and music fans to celebrate the 45th Anniversary of Summerfest and win great prizes at the same time. Summerfest has teamed up with Tap Milwaukee and Boston Store’s exclusive surf and streetwear apparel brand Mambo, to search for the next great musical talent. 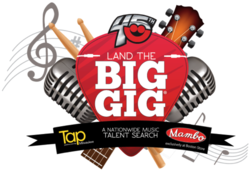 Aspiring musicians and acts nationwide are challenged to enter the “Land the Big Gig” music talent search now through Sunday, April 22 by submitting a performance video of original material online at http://www.LandTheBigGig.com. Starting today, artists 18 years and older are encouraged to upload a performance video of original material online at http://www.LandTheBigGig.com through the end of the entry phase of the competition, Sunday, April 22, 2012. Complete rules and information can be found on the contest website. Public voting commences on Wednesday, April 25. Music fans will have the chance to vote for their favorite entries on http://www.LandTheBigGig.com and be entered in the consumer sweepstakes. One lucky voter will win a brand new 2012 Hyundai Veloster valued at more than $17,000 from Boucher Automotive with a trip for two to Milwaukee’s Summerfest that includes round-trip airfare, hotel accommodations, tickets and VIP Deck passes to Summerfest 2012. The top 45 vote-getters will be announced mid-May. A second round of voting will then begin to narrow the field of 45 Semi-Finalists to the Top 3 Finalists with those three performers/musical acts winning a trip to Milwaukee, Wisconsin to perform live on stage at Summerfest on Wednesday, July 4 in front of fans and a panel of celebrity judges. The judges will score the performances and select one winning act who will be awarded the top prize of $25,000. The second and third place finishers will win $12,500 and $7,500 respectively. Summerfest has rocked Milwaukee’s lakefront for 45 years and wears the crown as the “World’s Largest Music Festival”. Featuring over 700 acts on 11 stages over 11 days, Summerfest shares unforgettable live music experiences with approximately 900,000 music fans from around the world every year. “Boston Store and Mambo are excited to be part of this talent search. Mambo’s casual, free-spirited surf and streetwear compliments the vibe of Milwaukee’s lakefront Summerfest celebration” said Christine Hojnacki, Vice President, Special Promotions and Publicity at Boston Store. Fans and performers are encouraged to stay connected to “Land the Big Gig” via LandTheBigGig.com, Summerfest, Tap Milwaukee and Boston Store for updates and info. Summerfest 2012 will take place June 27 – July 1 and July 3 – 8, from Noon until Midnight and will be closed Monday, July 2. In 2012, The “World’s Largest Music Festival” and Milwaukee’s cornerstone summer event will celebrate its 45th Anniversary. Since 1968, Summerfest has provided unforgettable live music experiences for fans from around the world. Summerfest attracts over 700 bands, including the music industry’s hottest stars, emerging talent and local favorites and hosts a diverse selection of food and beverage vendors, marketplaces and interactive exhibits set against the Lake Michigan and downtown backdrops, creating a festival experience like no other. Patrons can also enjoy Miller Lite, the Official Beer of Summerfest. For more details visit Summerfest.com, Facebook.com/summerfest or Twitter: @Summerfest. TapMilwaukee.com is Southeastern Wisconsin’s essential guide to entertainment, providing everything you need to know about going out, staying informed and sharing that information with friends. Tap was created in 2011 to engage a growing market of readers who want local entertainment news at their fingertips. Our readers are passionate about things to do - from music to movies to dining and galleries – TapMilwaukee.com has it. Mambo is an Australian company established in 1984 and is owned by The Nervous Investor Group, a collective of creative and surfing entrepreneurs. The brand is built on the pillars of surf, art, skate, music and humor. Mambo has hosted major international music festivals, surfing events and has had its unique art exhibited in museums around the world. Mambo develops young artistic talent, produces innovative products, artworks and quality clothing. In 2000, due to demand from the athletes, Mambo designed the Australian team uniforms for the opening ceremony of the Sydney Olympic Games. There have been several books written on Mambo, as well as a lead business TIME magazine article, and just last year, esteemed UK publication, Cult Street Wear, listed Mambo as one of the world’s most influential apparel brands of the past 30 years alongside Nike, Adidas and A Bathing Ape.